And that just about wraps up tonight's live text coverage. Thanks for your company this evening, on a night when Leeds signalled their intentions to end their 15-year absence from the Premier League with an emphatic win over West Bromwich Albion. Our next EFL coverage on the BBC Sport website and app is on Saturday from 14:00 GMT. Kemar Roofe, Leeds' injured top goalscorer, is down in the tunnel area congratulating his victorious team-mates. Leeds are a point clear at the top of the Championship. Second-placed Norwich are at Millwall tomorrow, while Sheffield United - who have dropped to third - face city rivals Wednesday on Monday. West Brom remain fourth, but are now six points off the top two. How damaging will this loss prove to be? Leeds forward Tyler Roberts told Sky Sports: "Losing the last game, we needed to show what we're about and get back to how we were at the beginning of the season. We definitely did that. We started the game quickly and that was the goal. We did that and continued that throughout the match." Leeds goalscorer Patrick Bamford: "I've missed a few chances in the past few games but I knew if I kept getting the chances I'd score. We've shown that we're back on track and we needed this. It was important tonight." 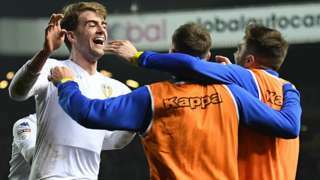 Leeds go top of the Championship in emphatic fashion. That's an outstanding performance by Marcelo Bielsa's men. West Brom simply had no answer. Only three minutes to add on, but it's enough time for Ezgjan Alioski to score Leeds' fourth. Substitute Jamie Shackleton is set free down the right side and Alioski turns in his low cross into an empty net from four yards out. Three minutes of added time to play at Elland Road. I'll have reaction from the Leeds' camp just after full-time. The hosts make a late change, with Tyler Roberts - who has set up two goals tonight - coming off to a standing ovation. Jamie Shackleton is on. It's an old and obvious football cliche that goals change games, but Leeds made a lightning-fast start and scoring after 16 seconds had a huge bearing on this contest between these two promotion rivals. West Brom didn't know what had hit them and it's been an uphill task for the visitors since then. A painful moment for West Brom's Mason Holgate, who goes down after being crashed into by his own team-mate. Leeds' head coach Marcelo Bielsa isn't happy with a challenge by Dwight Gayle on Mateusz Klich and lets the officials know about it. His reward for complaining is a yellow card. Leeds make their first change, with Stuart Dallas replacing Jack Harrison. Norwich and Sheffield United may still have their respective automatic promotion fates in their own hands, but on tonight's evidence, Leeds are going to take some stopping in the race for the Premier League. The challenge is to repeat tonight's performance - one of their most accomplished of the season - regularly in their final 11 games. West Brom are far from out of it either, but they'll need to put together their best run of the campaign in the closing weeks to keep pace with the top three. Leeds are smelling blood here. Ezgjan Alioski fancies getting involved in the goal action and the Leeds full-back's effort from 20 yards appears to be tickled around the post by Sam Johnstone. A corner is given but it amounts to nothing. West Brom's final substitution sees Jefferson Montero come on for Hal Robson-Kanu. The Leeds fans are in full voice now - their team are heading top of the Championship table. The TV cameras pan to one home fan who has his shirt off and is twirling it around his head. I know it's been warm in England this week, but that's taking it to extremes. Leeds get a third on the counter attack and it looks to be all over now. Tyler Roberts drives past Jake Livermore and plays in Patrick Bamford, whose shot deflects in off Craig Dawson and into the bottom corner. Albion's second change sees Sam Field replace Rekeem Harper. No real surprise that Gareth Barry is the man replaced by West Bromwich Albion - having already been booked and just been given a final warning by the officials. James Morrison, who has been known to pop up with an important goal or two from midfield, is the man brought on to replace him. Gareth Barry is a tad fortunate to still be on the field here. The West Brom captain, only just booked, is pulled up for another foul and the referee has a long chat with the ex-England international. Leeds' Mateusz Klich forces a save from Sam Johnstone from the subsequent attack. This is much better from West Bromwich Albion. The men in yellow and green are putting Leeds under some real pressure, but the home side's threat on the break is always there. Their latest attack is halted as Jay Rodriguez is muscled off the ball by Pontus Jansson, who lets out a huge scream in celebration as the ball dribbles out for a goal kick. I actually laughed out loud at that. Leeds head coach Marcelo Bielsa was a happy man in the first half but that smile isn't quite so prominent on the Argentine's face right now. A third goal may see it return, but at the moment it's Albion who are doing all of the attacking.